Here I begin what will be a massive Java Video Tutorial. I start with all you need to start writing Java programs. I then cover just about anything you’d want to know about Javas primitive data types. I cover declaration statements, expression statements, all the types and how to convert them. This tutorial starts out slow, but by the end you will be a Java expert! Make sure you print out the code below to help you learn easier. I promise watching this Java video tutorial from beginning to end will teach you everything there is to know about Java. I hope you enjoy it. // Variable names are case sensitive. Age is not the same as age. * (float) & (boolean) & (char) don't work. awesome tutorial, please provide more videos as soon as possible.. Your tutorials are terrific and most inspiring. It would be most beneficial to follow the videos with either subtitles or a transcript of the accompanying lecture (audio input from you) as I am severely hearing impaired in both ears. I hope you don’t mind this humble request as your comments in the code for each lesson are usable during revision. Thank you for your helpful & continued advice. You are a gem to look into this request further. I’ve tried the caption option on YouTube, unfortunately it doesn’t work at all for me. Apart from resorting to your on line help with understanding the code in the brilliant lessons, would it be possible to increase & expand on your commented explanations in the comments in the code for each lesson. I remain greatful for your most kind consideration of my request. Thank you very much. I’m from the London, UK and can only use English, but would much appreciate any help with computerspeak, as it can be as daunting as ancient Greek! On a tangent, may I please request your learned advice and help about availability of Video tutorials for computer hardware? I look forward to hearing from you. Thank you very much, once again. I wish to thank you for your continuing and enthusiatic help, encouragement and inspiration with regards to my requests for help with image recognition and simulating speech. It is so wonderful that this is associated with your own exploration of AI. I must say that I am really looking forward to your planned tutorial on electronics, which would work all the way up into a functioning machine with an OS. I do hope you get the required time and resources to fit it in to your demanding schedule. I hope that this endeavour appeals and more people express their interest. In the meanwhile, thanks for all your well intended help. Thank you for the kind words 🙂 I really want to cover electronics and will get to it soon. Sometimes I get a bit overwhelmed by requests. Always know that I’m doing my best to fulfill everyones requests. Thank You Sir!!!! for such a g8 tutorial!!!!! terrific!!! You’re very welcome 🙂 I’m very happy that you enjoyed it! after covering almost the web languages programing you made the right choise to move to java. Thank you for your response, if possible try to make a tutorial series for advance java also, i never found tutorial series for this anywhere. Hello, sorry for answer in old topic. I would like to see turtorials about Hibernate/Spring. But first of all about JUnit, and testing. Thanks for being my teacher ! Have a nice day. Those tutorials are in the works. I will definitely cover them as soon as I finish up Android. Awsome, I am really waiting forward for them 😀 regards from Poland. I installed Eclipse as shown in yor tutorial. When I want to create a new file.java I cannot save it. I do not see any path as in your tutorial. Do I have to create a project first or did I do something wrong with the settings? Thanks. Thanks for your reply. It actually worked when I made a Java Project first. With this I was able to create and save the java file. I did create a workspace. Great tutorial on java! Can you make a tutorial on else, if, for while,arrays and loops. I am taking Java programming in school and I want to learn the basic concepts before I start taking my classes. Looking forward to the videos. I’ll cover more than just the basics. I plan to cover conditional statements, loops, OOP, Arrays, Strings, Collections, functions, Threads, Networking, regex, Swing, Streams, Databases, Servlets, etc. if possible please provide tutorial on servlet and jsp. i have a question, final keyword is used to make something constant, ie. (we cannot change it), but what is this mean that “we cannot change it” if i change the value of the final variable, in the program/code, i can do that, so what is “we cannot change the value of final variable”. It would be great if you could set some small assignments in Java so people can test their skills. The best advice I can give you is to study the video and then try to recreate everything out of your head. I’ll look into making assignments because I’ve received that request many times. is there is a(BigIntegar) in java or how can i? Great videos! I enjoyed your SQL Video’s they helped me get a B+ in my last class. Now I am watching your Java series to supplement my reading. The best tutorial channel on YouTube. I have a question though. My heart and soul is broken with Eclipse. I’m trying to run the HelloWorld code in Eclipse and all I get is a “Launch Error – Editor does not contain a main type”. Please help me before I throw my laptop out the window! Now that you have it on your eclipse screen click on the folder it has in it. You’ll see another folder named src. Inside of src, you’ll see default package. Save your java code in default package. If you don’t see anything in Package Explorer, right click in Package Explorer and Click New Project. Hi Derek excellent explanation.I was not having an idea in programming lang.after wacthing your series i am pretty much aware of the lang.great work derek. Hello Team,everything cant be spoon feeded.you all must start practicing wat derek has taught.his tutorials is sufficient for a person to become a good programmer.you people have to give your effort to after watching his video series. I am new to this so i dont know which program to download???? I use Eclipse Classic to write Java programs in this tutorial. It works and looks the same on every OS. I cover buffered reader and writer in Java Video Tutorial 32 and binary streams in Java Video Tutorial 33. Another question, I created a class and later deleted it along with the folder in the windows’ explorer. Now it give me error whenever I try to create that class. It says class type error when I try to give the name to that class. How do I fix this problem. I’m using eclipse. You have to replace the class to get your program to work. Maybe it is still in the recycle bin? Thanks for the tutorials. I have watched some of your other videos, but i have just started watching this series. Still these seem to be some of the most well made video tutorials out there. thnx for all the work i’m sure u put into these. After about two weeks of web surfing for concise to-the-point tutorials I discovered your videos on YouTube. I watched a majority of your Python 2.7 tutorials and can say that 50% of my knowledge was from those videos (the other 50% acquired over time and through my job). The speed and clarity of your videos stuck in my mind, and when I decided a few days ago I’d like to learn Java, I didn’t think twice about where to begin. Nothing else compares to these videos. You are the Master Tutor! Thank you so much for taking the time to offer these free videos. I have found that I absolutely love programming, and am excited to learn more and more, most of which will be with your videos. Don’t stop! Hi Justin, I’m very happy that you enjoy my videos. Thank you for taking the time to say you like them. I have many more in the works. I recently stopped because I have a terrible cold, but I’ll start making them again next week. Always feel free to ask questions. (float) & (boolean) & (char) don’t work. what do you mean by float, boolean and char not work? Do you mean by casting double to float, boolean and char is not working or for any type to float, boolean and char also not working? I have tested in following way and it shows that float, boolean and char can be casted. Would you mind to explain further? Also, what do you mean by (char) stays as a number instead of a character?? can you provide some example? Why number = input.nextInt(); is done twice …. HELP!!! nextInt() gets the integer entered on the keyboard. Ask for the next integer entered in the keyboard. Hi – I need some help. I have filled an array with random numbers, found the minimum value and know what position it is in. Now I need to switch the number in that position with the number in position 0, left sentinal. I don’t have my code with me to include here but is there anyway you can help me by explaining how I would go about this? Thanks – love your tutorial! How do you recommend watching your videos and practicing to really understand, remember, and apply all of the stuff from the Java tutorial through Android, which you are doing now? First of all thank you so much for this wonderful job !! PPS : Sorry for my worst english ! You’re very welcome 🙂 How would you want the download to be structured? Do you want every tutorial available in one download? Understand that I sometimes won’t have everything so heavily commented in the code I have on my computer because I never planned on doing that. Hi bro, your tutorials are fabulous, i have seen many tutorials online from premium faculties but not that impressing, your tutorials are excellent and brilliant, i dnt have words to praise your style. Humble request to upload web services(soap,rest) in java tutorials. Thank you 🙂 I’d say give the Android tutorials a try and if you find that you need help I have a Java video tutorial that can help. which basic laguages i need to know for android development. which basic laguages i need to know for android development? your effort you put in. Derek can you provide all of us tutorial on collection and mapping in detail how it can be used to carry database and class object. Your video is awesome. I really appreciate you put your effort on it. Can you provide tutorial on collection and mapping how it can be use with database object and class object, multithreading in detail. but please what theme did you use for the frames? Great fan of yours. You teach better than any teacher I have come across. I want to make my fundamentals strong and clear Java certification by oracle. I believe watching your Java series and of-course advanced topic I can shape up my skills and take career to new height. Any other MANTRA of yours is there then please teach us. Great People Leave Great Stories Behind. Thank you very much Sameer 🙂 You’re very kind. I’ll continue to do my best to cover these topics to the best of my ability. Thank you for stopping by my website. Hi, your tutorials are splendid, but l have a little problem, when watching after some time its fade, and its hard for you to see what you are doing , l dont know why , my appeal is for you to correct that , thanks. Big up. Give u my thumb. Thank you 🙂 It may help if you print out the code and take notes while pausing the video. That seems to help many people. Also since the notes are in your own words they tend to make you remember concepts later. I hope that helps. Thank you very much for all your videos, it is so informative for the beginners. I been watching your java,html,css and mysql video and lot that I can learn from your videos. I would also like to raise a request to please cover advance java video tutorials as well. I hope you would consider request in spite of your busy schedule. You’re very welcome 🙂 What topics are you looking for in regards to advanced java tutorials? I have covered Design Patterns, Object Oriented Design, Refactoring, Java Algorithms and now Android with Java. I’m always interested in any other ideas for tutorials. Sorry if you missed these. My site isn’t that organized. I think the statement you have mentioned in this page in “Code from Video” section needs to be changed because this is correct only for static methods. I have been learning Java with heavy fire the past two months in aspirations to be a Java developer. I’ve read MIT courseware, several books on Java, and even downloaded a few “Learn Java” apps for quick reference while I am on my “Thinking Seat”! But no one else has broken down the language so eloquently as you have. I’m only on the 15th video so far, but you have explained everything perfectly. I have a greater understanding for Java now and hope to be through the videos by the end of the month! Thank you very much 🙂 I’m happy to hear that I was able to help so much. I continue covering java in my Design Patterns, Object Oriented Design, Refactoring, Java Algorithms and Android tutorials if you are interested in learning more. Always feel free to ask questions. I do my best to help. Oh I will learn however much I can gobble up! I was a little stumped in regular expressions (especially the phone number part) but I managed to work my way through it. Will you be offering any tutoring in C++ as well? Would it be an easy jump after I’ve learned Java? Can u please do a tutorial on the seperate things you need to learn to make a minecraft mod? ?If it is not already there?? Here is a tutorial on setting everything up Minecraft Modding Guide. This tutorial is pretty good after you learn the basics of Java. how about scala,ruby on rails,opengl and system programming(linux commands,bash programming etc)is there any change to make tutorials for these languages? Zillion of thanks for your great tutorial it is Time Saver + Money Saver = Make life Easy! but i have a small request….. I am just wondering can you make all those code in pdf format so we don’t need to print which saves money and tree 🙂 and more importantly we can upload it in Ipad and read when we watch the videos. Thanks once again. God bless you! A Zillion you’re welcomes 🙂 I’m glad you enjoyed it. Can I have codes for all of your java videos, if its possible?? 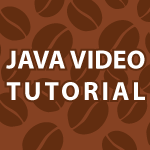 All the videos and the code is available on this one page Java Video Tutorial. I hope they help. I have a question on servlet. In the below web.xml content, Why / is used to mention login.jsp and loginpage. What is the meaning? I’m sorry, but I’m not sure which specific tutorial you are referring to. I finished your Java videos back in October, and thanks to you I obtained my OCAJP Certification in November and looking for more I can do in the programming world. Thank you, sir! i want to learn java as i am beginner .. basic syntax how to make logics and how to use oop in java please help me..recommend me good book.so that i start learning fast & easily. Q:;you make videos on books lesson? The best book is Heads First Java. Feel free to ask questions. i do my best to help. The book everyone seems to like is Heads First Java. It is fun. what can i do after watching your video…. i want to learn fast . Is this possible that we can sort the CHAR in String? Check out my String Builder tutorial. I think that is what you need. Could you notice the following ? Thank you 🙂 I corrected the errors. Now you know why I have never made a video on grammar. By the way if you ever go in Belgium please tell me and I will buy you a drink 🙂 or something you like to reward you for the good work ! You deserve it ! Thank you 🙂 I’d love to go to Belgium some day. My wife would love it if I left the house every once in a while as well. have no idea on problem solving. I have a question, I have been watching your tutorials through and I have been deleting all the code when I went to the next video and realized that this code would be great for reference with the comments in the future because i’m new to java, so I was wondering if there was any way to download all of the files into eclipse and put them into a project so that when I am coding in the future I will have a big reference for the code. Thank you, very clear and useful way of explaining the fundamentals!! Thank you for the kind message 🙂 May God bless you as well. Hi I love your videos. But I have a question. If I learn Java, will it help me in making Android Apps? If not, what programming language is used to make Android Apps? Which software do you use to film your videos? Lastly, what programming language do you need to know to make IOS apps? Yes Java is used to make Android apps. iOS is normally programmed using Objective C.
your java video tutorials are very good for newbie’s…can you please make some for java serial communication??? Thank you 🙂 I’ll be making some new java tutorials soon. Awesome tutorial, how do you know a lot about a lot? Hi! I am trying to build a web browser with additional fuctionality like progress bar , bookmarks, back, forward, menu,save, print … is it possible to build it with only java programming or not ? I have the ideas but unable to implement them … Can you help me or suggest me anything? I covered how to make a basic browser using JEditorPane. You may like JxBrowser. It allows you to embed a browser. Thank you 🙂 Always feel free to ask questions. Derek? On those java tutorials that you uploaded, does it covered everything about java? It covers a vast majority of Java. I even make a pretty complex game by the end. You can see the whole thing here Java video tutorial. I don’t know how I did it, but it is the most popular Java video tutorial online as far as I know. I think your tutorial is fast and superb and I hope as you have said to become an expert even before I reached last video. Thank you 🙂 I did my best to teach everything about Java. I also have tutorials on object oriented design, algorithms, design patterns, refactoring, UML, etc. to help you become an expert. Simply the best, turns out it’s like really easy. Your tutorials are by far the best out there, you talented man really talented well done! Thank you 🙂 I’m glad you find them useful.